Are the new Iranian President, Hassan Rouhani, and his foreign minister, Mohammad Javad Zarif, taking the United States for a ride? Have they agreed to an interim deal on enrichment as part of a master plan to lull the West into a false sense of security so that they can reverse course after eviscerating crippling sanctions? And what’s up with their “charm offensive” in the United Nations, Europe, and even the Gulf? Israeli Prime Minister Benjamin Netanyahu isn’t buying this for a New York minute. Neither is the House of Saud. Nor many on Capitol Hill, who are rallying behind legislation championed by Senators Robert Menendez and Mark Kirk that would have the practical effect of stymieing a more comprehensive nuclear deal by linking it to a long charge sheet of Tehran’s misbehavior. All of which reminds me of the advent of Mikhail Gorbachev and the skepticism that accompanied his strange, un-Soviet-like pronouncements. Gorbachev’s accession to power was inconceivable without the track record of his predecessors, Andropov and Chernenko. Obama in the White House? Impossible without George W. Bush. The amazing Pope Francis was preceded by the disheartening Pope Benedict. Major course corrections sometimes require big messes. You’ve got to be in bad shape before trying to turn the corner. One definition of rock bottom is Mahmoud Ahmadinejad. After yet another Gorbachev signal – a promise to stop arming the Nicaraguan Sandinistas – Bush’s White House spokesman, Marlin Fitzwater, characterized Gorbachev as a “drugstore cowboy.” Most Americans were unfamiliar with the term, but its inference was plain: he was a phony who merely dressed and talked the part of Mr. Reasonable. 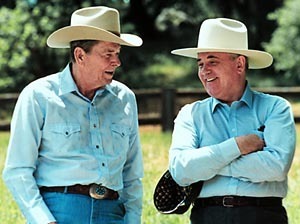 After a few months of drift, President Reagan embraced the challenge of engaging Gorbachev fully, despite his significant domestic obstacles and despite disturbing Soviet policies that Gorbachev couldn’t immediately tackle. When I campaigned to become President of Iran, I promised to balance realism and the pursuit of the Islamic Republic’s ideals – and won Iranian voters’ support by a large margin. By virtue of the popular mandate that I received, I am committed to moderation and common sense, which is now guiding all of my government’s policies. That commitment led directly to the interim international agreement reached in November in Geneva on Iran’s nuclear program. It will continue to guide our decision-making in 2014. Indeed, in terms of foreign policy, my government is discarding extreme approaches. We seek effective and constructive diplomatic relations and a focus on mutual confidence-building with our neighbors and other regional and international actors, thereby enabling us to orient our foreign policy toward economic development at home. To this end, we will work to eliminate tensions in our foreign relations and strengthen our ties with traditional and new partners alike. This obviously requires domestic consensus-building and transparent goal-setting – processes that are now underway. This is remarkable language for a national leader who faces intense and perhaps disabling domestic opposition. He and Foreign Minister Zarif – who is playing the part of Eduard Shevardnadze – are going out on a limb at a time when many on Capitol Hill are reaching for chainsaws. Section 301(a)(2)(F) requires the President to certify that the United States seeks an agreement “that will dismantle Iran’s illicit nuclear infrastructure.” But while Iran may agree in the end to dismantle some of its nuclear infrastructure, there is no realistic chance that it will dismantle all of its uranium enrichment capability. Section 301(a)(3), regarding a suspension of sanctions beyond 180 days, adds the requirement that an agreement be imminent under which “Iran will…dismantle its illicit nuclear infrastructure…and other capabilities critical to the production of nuclear weapons.” This raises the same concerns as does the paragraph just noted, plus the new question of what those “other capabilities” might be. At a minimum, such ill-defined requirements invite future partisan attacks on the President. Section 301(a)(4) reimposes previously suspended sanctions if the President does not make the required certifications. This paragraph applies not only to the sanctions mandated by this bill, but also to “[a]ny sanctions deferred, waived, or otherwise suspended by the President pursuant to the Joint Plan of Action or any agreement to implement the Joint Plan of Action.” Thus, it moves the goalposts even for the modest sanctions relief that the United States is currently providing to Iran. As admirable as these objectives are, Tehran does not accept them as breaches of “its diplomatic commitments.” Whatever progress toward their achievement may unfold lies in reaching a more comprehensive nuclear deal, not in disrupting and linking it to the entire panoply of issues now bedeviling US-Iran relations. President Reagan focused on deals with Gorbachev to reduce nuclear capabilities without linking them to shenanigans in the Horn of Africa or to the resolution of unilateral US interpretations of Soviet arms control commitments. Political leaders usually don’t take big risks seeking interim deals only to torpedo more consequential ones. The torpedoing is instead done by onlookers who feel deeply uncomfortable with the shape of the new and by well-meaning or crafty politicians looking to score points while passing the buck for the messes they create. It’s way too soon to argue that Rouhani is an Iranian version of Gorbachev. But they have embraced similar rhetoric to challenge stereotypes. Rouhani may well meet Gorbachev’s fate, as well. In this event, Iran, unlike the Soviet Union, won’t fall apart. It will instead revert to the familiar. Alibek himself was a dedicated bioweaponeer until his own “road to Damascus” moment, touring bioweapon research, development and production facilities near Pine Bluff, Arkansas which were literally buried in dust and other evidence of long-time inactivity. Then he began his own journey toward trying to shut down a covert bioweapons program in the Soviet Union for which the justification he was given no longer existed. But getting back to the Gorbachev analogy in this article, we have the word of the man who was at the pinnacle of Biopreparat’s leadership that Gorbachev himself was knee-deep in duplicity regarding the Soviet Union’s deployment of weapons it had agreed not to develop or deploy for over ten years. It doesn’t speak well for the prospects that Rouhani will cooperate in hemming in an Iranian nuclear weapons infrastructure he doesn’t even entirely control. What is Rouhani’s background? Did he visit any western schools? “The website of the Center for Strategic Research, a think-tank headed by Rouhani, misattributed his PhD to Glasgow University rather than Glasgow Caledonian University and confusion ensued as a result on whether he was a graduate of either university, especially as he was known during his student years by his birth name “Hassan Fereydoun”. Glasgow Caledonian University carried out an internal investigation to confirm Rouhani’s alumnus status and after confirming it, it published Rouhani’s theses abstracts and a video showing him being capped, as Scottish academic tradition provides, during the University’s 1999 graduation ceremony. Analysis by three bloggers indicated that two passages in his PhD thesis were identical to a 1991 book by Mohammad Hashim Kamali. The University library confirmed that Rouhani had cited Kamali’s work both in the main body of the thesis and in the bibliography and that his theses were under no academic investigation. So, yes, Hassan Rouhani has done the Western academic experience and gotten the cap, sheepskins, and obligatory “shadow of academic misconduct” T-shirt. Thanks for unpacking this destructive bill. If you’re comparing Rouhani to Gorbachov in the sense that it led to the collapse of the Soviet Union, you should look for other metaphors. Iran is not the Soviet Union and this isn’t the Cold War – Iran’s nuclear program is in fact massively popular at home. The Iranians are no offering any concessions that they haven’t been offering for years, even before Ahmadinejad’s administration. The difference is that the US finally gave up imposing the precondition of “zero enrichment” on talks, seeing that the EU courts had already started ordering the lifting of sanctions, which weren’t all that “crippling” considering that Iran’s economy was expected to grow again in 2014 by the IMF. Mr. Krepon: you have now changed the article to reflect the correction. You changed “Contras” to “Sandanistas.” You’re welcome. Please note that the time of your readers is just as valuable as yours, and it can be disheartening when a polite and relevant comment is censored. In this case, the censorship is also slightly puzzling, as my comment helped improve your blog post. Respectfully, I make one request: could you mention what guidelines are used for moderating comments? I am very interested in adhering to any guidelines you might have, since I don’t wish to put in time writing something that then is censored. In particular, I’m interested to know if my point of view makes a difference. I don’t believe in American exceptionalism, and I talk about the United Sates with the same tone that the bloggers on this site talk about al-Qaeda, Iran, North Korea, etc. And this has led to my comments being regularly censored. This is perhaps the seventh or eighth time this has happened. If lack of reverence for the United States government and its military disqualifies comments, it would be helpful if you told your readers that. Thank you. If a comment has depth or insight, it gets in. If someone is just running his or her mouth, it usually doesn’t, unless the sentiment expressed clarifies the nature of the problem discussed in the blog post. If the comment is respectful, it goes in. If someone is slanging someone else, it doesn’t. I do not post comments that use invective or incendiary language, which is why I didn’t post your previous comment. Posts that are self-righteous and repetitive get winnowed down because they remove oxygen and dry up commentary. I am also selective about comments from individuals who seek to hijack my blog posts for their own policy agendas. WASHINGTON – Members of the Air Force nuclear missile unit hit with the double whammy of drug and cheating scandals are “brokenhearted,” their commander said Friday. In his first interview since the investigations were announced Wednesday at the Pentagon, Col. Robert W. Stanley II said the 341st Missile Wing is compensating for the loss of 34 launch control officers by increasing the work load on others. They operate 150 nuclear-tipped Minuteman 3 missiles. Stanley said this can be managed “pretty easily” because the unit has long had contingency plans for the sudden loss of large numbers of launch officers for any number of reasons, including illness. It has taken a toll, nonetheless. “…INS Arihant, with its 750km range K-15 missiles, will finally plug the big operational gap. Japan on Monday urged its Asian neighbors to adopt stricter rules on the export of sensitive nuclear items, Kyodo News reported. The Pentagon has denied to Congress that it ever established a nuclear missile launch code of “00000000,” despite earlier reports, according to Foreign Policy. The House Armed Services Committee had demanded to know whether media reports were accurate that from 1962 to 1977, the Air Force used an eight-zero authorization code for the launching of strategic missiles. The source of the reports was former ICBM launch officer Bruce Blair, who went on to found Global Zero — a movement that urges the total elimination of nuclear weapons. “A code consisting of eight zeros has never been used to enable a MM ICBM, as claimed by Dr. Bruce Blair,” the military reportedly said in its response to Congress, apparently referring to Minuteman ground-based missiles. Foreign Policy said it had viewed the correspondence to Capitol Hill. PENTAGON: In the wake of drug abuse and cheating on proficiency tests at nuclear missile silos, Defense Secretary Chuck Hagel ordered a two-pronged review of the nuclear weapons program today. Hagel issued his memo after speaking with Air Force Secretary Deborah Lee James, who had toured the service’s ICBM sites in the wake of the scandals. The Hagel memo orders a meeting in the next two weeks by senior officials, including himself and Chairman of the Joint Chiefs Gen. Martin Dempsey, to discuss any needed personnel changes, Kirby said. This group will draw up an action plan while looking at the leadership, management, training, and culture of the men and women who handled and would fire our nuclear weapons. The group will identify problems and best management practices and recommend solutions in 60 days. In parallel, Hagel ordered up an independent review of the strategic deterrence enterprise. They will tear apart the Pentagon’s action plan and make their own recommendations 90 days from the time they start. Lop Nur is also the site for China’s nuclear weapons tests. One might have thought the camels would have been bombed out of existence, but no.